Le Lac is an exclusive gated enclave of luxury estate homes situated on 200 acres of tree-lined streets, interconnected lakes, and gorgeous South Florida landscape. Located in the heart of Boca Raton, this prestigious community is tucked away amidst the area's lush natural foliage, providing homeowners with the upmost privacy and security available. Ranked as one of the top ten exclusive gated communities by Forbes, Le Lac has truly earned its reputation for excellence and its place as one of the top Boca Raton gated communities. This residence is being sold in As-Is condition. These amazing estate homes sit on lots of 2 to 6 acres and range in size from 7,000 square feet to over 45,000 square feet. Naturally, some of the nation's most elite political and business figures reside in this sophisticated community. Residents in Le Lac can enjoy spending their days kayaking, boating, or even fishing on the fantastic lakes that lie within this gorgeous community. The 200 acres of green, natural Florida foliage truly create an ambiance that has most of the residents living here year round. 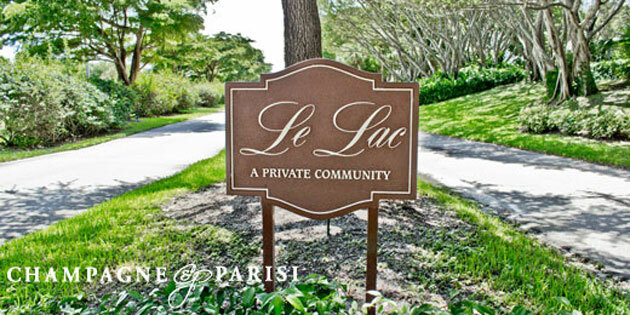 Overall, this hidden gem is a true dream for the small few that have the fortune of calling Le Lac home.